Special Offer. Buy 6 Bottles for £65.00 each. Save £60.00 !! An intense pink peppercorn colour with a fine stream of persistent bubbles. The nose has aromas of red fruits and summer berries. On the palate the first impression is freshness with notes of fragrant wild strawberry, this develops into creamy ripeness with a hint of vanilla. If the wine is allowed to blossom in the glass, a further layer of citrus aromas appears, with notes of grapefruit on the finish. The wine boasts a linear structure and rare finesse complemented by intensity of flavour. This is a Rosé Champagne with great personality. Produced only in limited quantities the Rosé Vintage 2008 has been aged for 6.5 years in cellars before being disgorged and released onto the market. 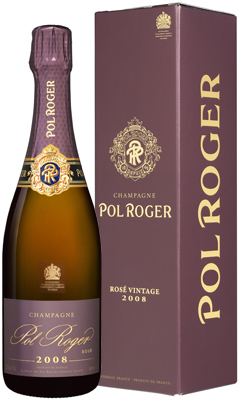 Pol Roger does not make a Non-Vintage Rosé, preferring to release only in vintage years. The Brut Rose Vintage is produced from a blend of 50% Pinot Noir and 35% Chardonnay drawn from some 20 Premiers and Grands crus on the “Montagne de Reims” and the “Côte des Blancs”. In order to obtain its delicate colour and subtle nose 15% Pinot Noir, from selected vineyards in Bouzy, Ambonnay and Cumieres, is vinified “en rouge” and added to the blend prior to the second fermentation.